In 2010, there was 1 new post, growing the total archive of this blog to 37 posts. There were 6 pictures uploaded, taking up a total of 4mb. The busiest day of the year was October 11th with 102 views. 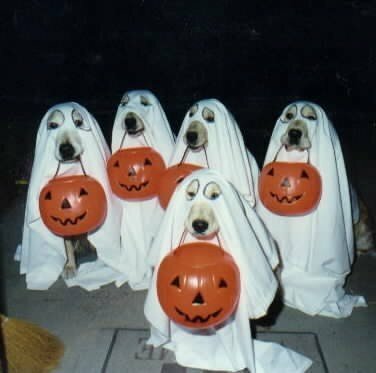 The most popular post that day was Happy Halloween. The top referring sites in 2010 were facebook.com, roadtripmemories.com, mikenchell.com, rwarn17588.wordpress.com, and search.aol.com. Some visitors came searching, mostly for t@b trailer, dog costumes, indianapolis skyline, tab trailer, and t@b trailer for sale. After 11 years of ownership, the time has come for me to part with my faithful steed, my 1965 Chevrolet Corvair Monza coupe. First a little history. I purchased it at a used car lot in Greenfield, Indiana in April of 1999. The folks at the lot didn’t really know anything about its history, other than it came from Kentucky. I was in the market for a ride that I could take to car shows & cruise-ins…something to fill free time I had on Friday & Saturday nights. 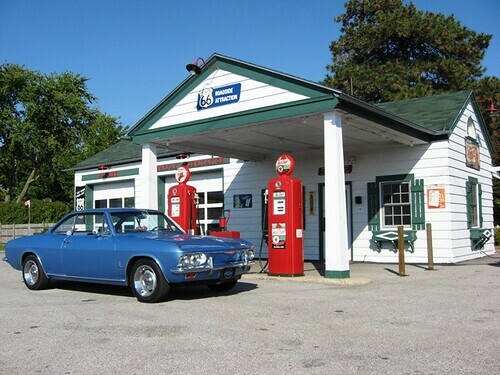 I had previously owned a ’68 Corvair that I purchased as my first car in 1987, plus my dad and several of my brothers owned Corvairs since the 1970’s, so we were the epitome of a Corvair family. Some basics of it: As mentioned, it’s a ’65 Monza coupe, 110 hp, 164 cubic inch air cooled flat 6 cylinder with a 2 speed automatic powerglide transmission with dual exhaust. It currently has 131K miles on the odometer. I bought it with 93K, so over the 11 years, I’ve averaged about 3,500 miles/year. It’s been a good car and met the needs I first had for it. 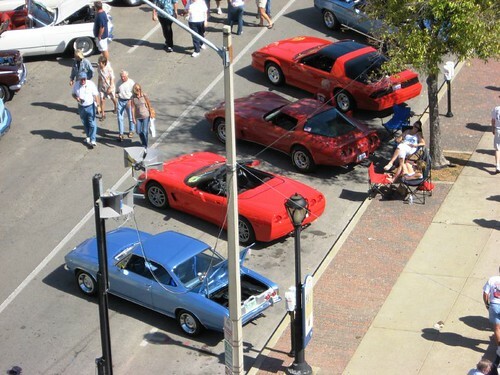 I took it to a lot of Friday & Saturday night car shows & cruise ins. It’s also a GREAT car to just get in & take a drive out in the country or a twisty two-lane road somewhere. It’s been as far west as Iowa & Oklahoma and never left me stranded. 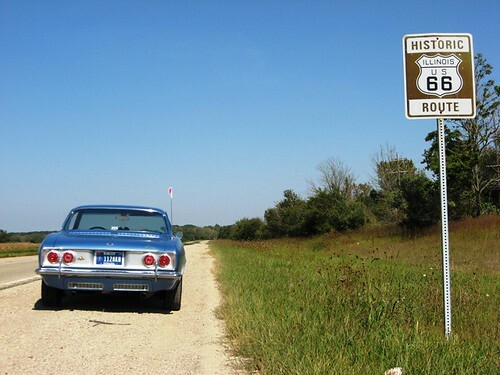 I’ve taken it on many road trips around the midwest during various motor tours, especially along fabled Route 66. Now, for the overview. I won’t get into every detail, but just some things over the past few years. First, this car is not a concours quality Corvair! 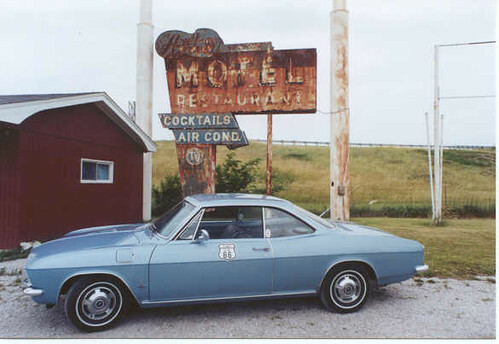 What it is is a solid, sound running Corvair that you can show off with pride at a cruise-in or benefit car show. We painted it in 2006 after some body work here & there, but nothing real major. Currently it does have some minor bubbling in a couple of typical Corvair prone areas, but nothing is rusted through. Please refer to the link to the Flickr page below for more pictures. Mechanically it runs well. I purchased two new rebuilt carbs from Grant Young at Wolf Enterprises in 2009. 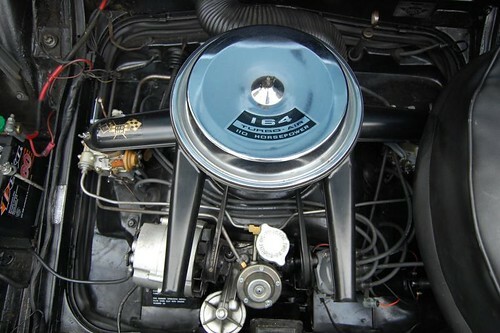 He’s a highly respected Corvair carb guru, and it was a purchase that was well worth it! As for leaks, no, it’s not bone dry underneath. The pesky transmission cable tends to leak when the car’s not run for a period of time, but it’s not too difficult of a fix. I can give the names of a couple of highly respected Corvairs mechanics who can fix it. O-rings and some other engine seals HAVE been replaced since I’ve owned it. It’s also got newer AC plugs, cap/rotor, plug wires, and coil. I also put a Pertronix electronic iginition on it in 2001 and it’s still running strong. Also for the past two summers I’ve used AMSOIL synthetic motor oil. Interior: I had the seats reupholstered in ’02 and got the material from Clark’s Corvair Parts, along with new carpet. I also installed a Pioneer CD stereo with 2 6″X9″ speakers in the rear and two 2″ speakers under the front dash grill. I also replaced at some point over the past 11 years the headliner, so it’s in good shape as well. 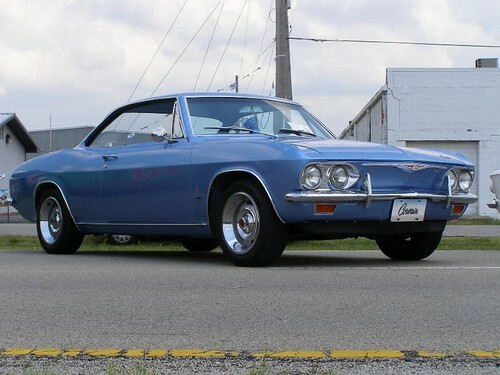 Other odds & ends: As mentioned, this is a GOOD Corvair, but not perfect! It’s got its share of squeaks & such as most 45 year old cars do. I’ve got a maintenance book that I thought I had most everything written down, but after looking through it, there were some things I didn’t write down, so if you have a question about something specific, I may not know the date, but I can tell you if its been dealt with! Also, you may notice in the pictures that the tail lights are those of a ’66-’69 Corvair. The reason? When we gave it a paint job, I decided instead of putting the ’65 tail light lenses back in, I wanted to go with the later version, which I liked better than the ’65s. Also, I had the rear cove painted Argent Silver as the original Corsas were painted. I always liked that, so I went with it, even though it’s a Monza. As for fuel mileage, on a highway trip averaging 55-60mph, I can usually get around 23-24mpg. As to why I’m selling it? Well, I was a single guy when I bought it 11 years ago with more time than I knew what to do with. But life changed, I married a great gal in 2002, and my interests have changed. We took the plunge last year and bought a small travel trailer and have fallen head first in love with camping. 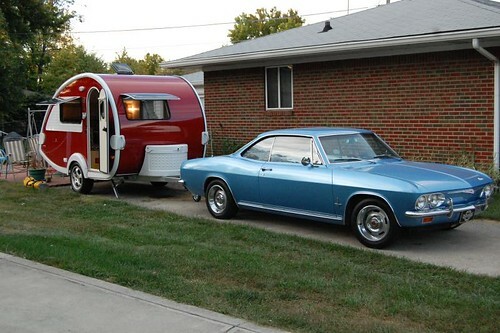 And no, the Corvair doesn’t have a tow hitch. I just did a little strategic positioning for this picture. Even though we’ve since sold this trailer and are moving up to another one, the fact still remains my time for the Corvair has become limited and I’d really like to pass it on to someone who’ll love it as much as I have and give it a nice warm garage to sleep in. If you have an interest and have any questions, I’d be more than happy to answer them! My asking price is $4,750 $4250. My e-mail address is: roadmaven@aol.com. Please note, I’m located in the Indianapolis, Indiana area. Some of you may know that we started the online forum for American Road magazine back in the fall of 2002. We were at a Route 66 festival in Springfield, Illinois in 2002 when our friend Jim Ross, one of the founders of the magazine, informed us he & Thomas & Becky Repp were starting a new magazine and he wanted us to run their forum. We started on Yahoo Groups and the forum was eventually taken in house by the magazine. It’s been a fairly easy forum to maintain, as all of our members “get it” as far as what we want and expect out of them. They make it easier because our members want the same thing we do. With our new found hobby of being RV owners, we’ve decided to create our own online forum for owners & fans of the T@B and T@DA travel trailers. After looking at a few options for forums, we chose one on Ning, which can be found here. I was a little leery at first, but after playing around on it for a couple of days, I’m hooked. It’s got a little of everything, as well as a Facebook edge to it. There’s another site for T@B owners on Yahoo Groups, but it can be unnecessarily restrictive on topics, so we decided to open another option for other T@B and T@DA owners. We plan on treating this forum like we do the AR forum: It’s a forum for the members. Monday marked the one year anniversary of the start of this URL. It was going pretty well early on, then I found Facebook in December. It seems my random nothingness moved from here to over there. I figure I should either try to give this thing more attention or keep it in moth balls so my three followers can move on with their lives. Maybe I could retool it into something else. Stay tuned….or not! My photography life started around 1984 when my parents bought me my first SLR, a Pentax K1000. I used it for photography class that year and it is still to this day a servicable unit. I used the K1000 nearly 20 years for all of my photography needs. It was in 2002 after getting back home from our Route 66 honeymoon that I decided I had enough of under and overexposed photos. I wanted something that had a little more modern features….like an “auto” button that would do the thinking for me. At the advice of friend & fellow Route 66er Jim Ross, I upgraded to the Nikon N65. This gave me all the features I was looking for as well as some automatic settings that covered up all the photography knowledge I had long forgotten since that high school photography class in 1984. I spent several hundred dollars on the N65 and an additional zoom lens. It gave me a lot of good prints that made spending that kind of money worth it to me. Never being one to want to break my routines in life, I’m usually the last one to switch to the latest & greatest. It wasn’t until 2007 when I finally broke down and bought my first digital camera, a Canon PowerShot A550. It’s a very nice point & shoot camera and takes some decent photos when there’s not a lot of thought to have to put into the shot. Jennifer, on the other hand, is quite the opposite. She’s not your typical “I want jewelry” kind of gal. She’d much prefer the latest electronic gadget over perfume and necklaces. She’s usually ready for the newest model of a camera before someone like me is even ready to buy the outdated stuff. She’s been serious into digital SLR photography for several years now and has become quite the pro, literally. I, however, finally broke through and got my first digital SLR last week. Per her suggestion, I went with the entry level Nikon D40. 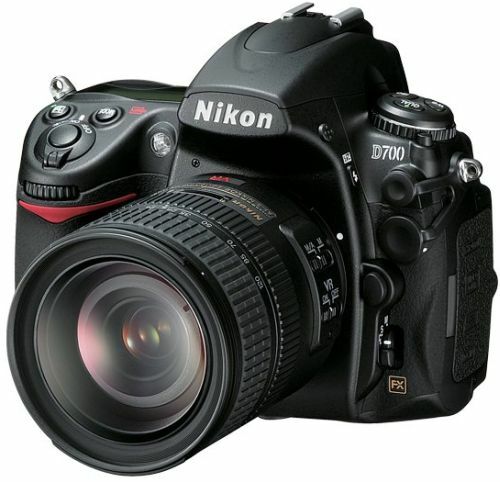 I stuck with Nikon because as she says, when it comes to DSLRs, “we’re a Nikon family”. 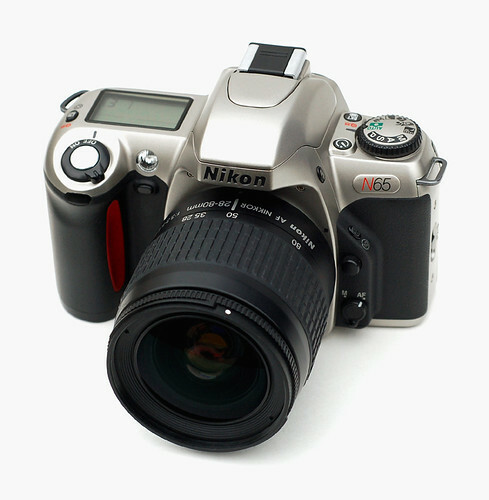 She had purchased the higher end Nikon D50 in 2006 and still swears by the quality of the unit as well as the quality of the images. My oldest brother also purchased a D40 a couple of years ago and he too raved about it. So, I finally decided after I spent a lot of time at the speedway this past May that I needed something that I could take decent shots of the action on the track, and the Canon A550 wasn’t built for that. It was time to go DSLR. I purchased it online through Wal*Mart as a package deal. It came with the body, 18-55mm lens, and 55-200mm zoom lens with the “Vibration Reduction” feature, which gives a helping hand to your photos under low light situations. I got it the day we went to the 2009 Indiana State Fair, so I was anxious to try out my new toy there. I waited until we got there before I took a shot with it. 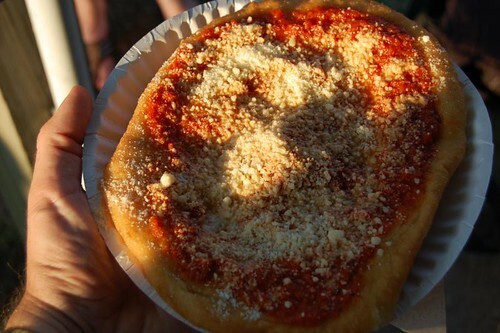 And that first shot was that of a deep fried pizza. With some coaching from Jennifer on what to do with the manual settings, I was really happy with the results, especially of those at the Midway when it was dark. I gave it some more work this past weekend at my dad’s birthday party. 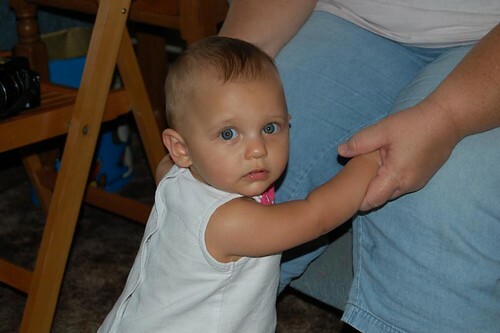 My 9 month old great niece Annabelle was more than willing to flash her blue eyes for me throughout the afternoon. I’m probably going to sign up for a photography class through IUPUI’s continuing studies program to give me a refresher of all the info I forgot since I took that photography class in 11th grade. However, it won’t be soon enough, as I’ll be throwing myself to the wolves at the end of August when I give it a workout at an IndyCar night race near Chicago. 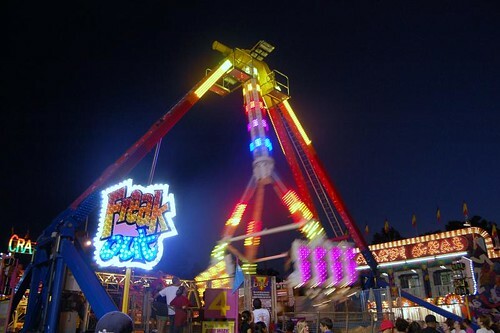 Low light & fast moving objects…that should be a breeze. Ahh, but I won’t be alone in learning my new Nikon over the coming weeks. Buying my D40 kind of pushed Jennifer over the edge in her decision to upgrade her D50, so she too bought a new Nikon, the D700 model. I can’t really explain all this model can do, but let’s just say it’s almost at the top of the Nikon DSLR food chain. The photos she’s created with her D50 have over the years generated a few bucks for her and even a free night’s stay at a Radisson in Cincinnati. I can only imagine this big daddy will probably generate enough bucks for her next Nikon! It’s been an unusual summer season for my yard. Due to a somewhat wet and cool summer, the grass has been as green as it is in April. This time of the year it should be a little crunchy and I should be cutting it every couple of weeks. However, no longer than 6 days for a cut has been the norm this year. What’s even more unusual about the yard is what popped up out of nowhere after last week’s cut. 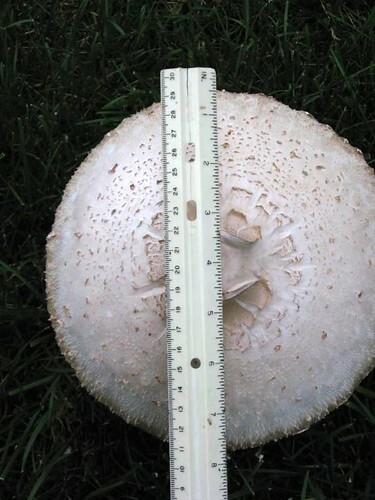 After the sixth day, we have fourteen HUGE mushrooms growing wild in our back and side yard, with one in the front of the house for good measure. And measure I did. There are two of them that check in nearly 8″ across. I’m not sure what to think of this. All spring & summer we never had one, and after last Friday’s cut of the lawn, they started popping up a couple of days later and haven’t stopped. Earlier this spring I tried a different lawn care treatment called NaturaLawn of America, which is an organic based lawn care treatment which is a little more friendly to the water supply it seeps into. I’ve always commented to a neighbor down the street how great his yard looks and he told me he uses NaturaLawn, however they come out and apply it. I chose the do-it-yourself route, as they have a 5 step program. The only other thing I’ve put down this year was some grub control, but I wouldn’t think that would have anything to do with it. Heck for all I know, the lawn treatment didn’t have anything to do with it either. Suggestions, anyone? 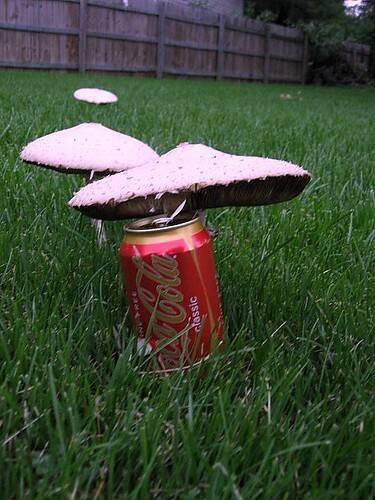 We’ve had mushrooms pop up periodically during the 7 years we’ve lived here, but nothing like this. Perhaps it’s a seasonal thing and that season is now & my yard is fertile ground. Being a big fan of sauteed mushrooms on my burgers, I’d really like to learn one day if these things are safe. But due to the “poisonous mushroom” fear, I’d never fully have the confidence to try. 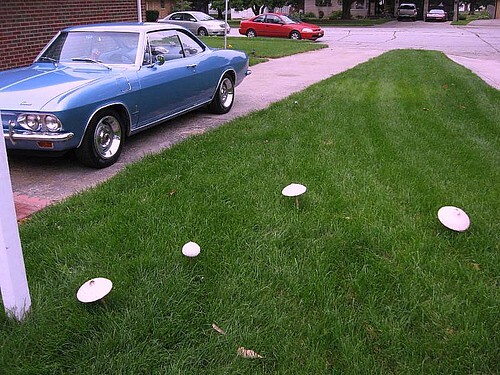 But then again, with the new yard treatment, these ‘shrooms should be totally organic….pois0nous or not.